Overview & specs of Grundig GSN10710DW Tall Fridge by Currys PC World. 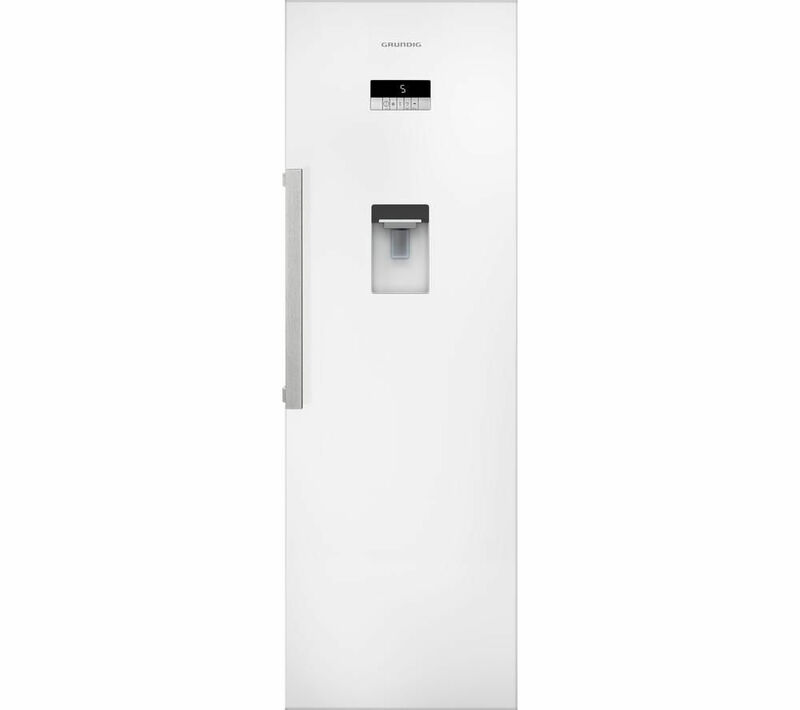 Enjoy fresher food for longer with this Grundig GSN10710DW Tall Fridge, complete with an in-door water dispenser, super fresh zone and hygiene-enhancing technology. Better storage for your food Thanks to IonFresh technology, the Grundig GSN10710DW keeps harmful bacteria at bay, maintaining clean interior air so that your groceries remain fresher for longer. Use the Super Fresh Zone for meat, fish and dairy products alike. It keeps the temperature at just above freezing, allowing different foodstuffs to retain their full flavour, fresh appearance and nutritional goodness for longer periods. Fresh fridge air Your Grundig GSN10710DW Fridge uses an air flow system to circulate cool air for an even temperature throughout, prolonging food freshness. If the door's been opened, this system allows the temperature to be quickly restored. Bad smells are eliminated by the clever inclusion of a carbon filter, which helps you fridge smell fresh all the time. Ice-cold water on tap Enjoy a cool glass of water direct from the GSN10710DW with its slimline internal water tank. This great feature lets you top up the tank as required for pure chilled drinking, plus it doesn't take up loads of room - so you can store tall items without hassle. Fast chilling, brighter lighting With its Quick Cool function, the Grundig GSN10710DW is able to swiftly lower interior temperatures as low as you require, chilling new groceries in less time. This will preserve their flavour and goodness, while protecting things you already have stored from rises in temperature. It's the ideal feature for when you're storing large volumes of food or when you've just returned from the shop. Enjoy bright illumination throughout the fridge with LED lighting, allowing you to find anything you need at any time while saving on energy consumption. Food storage is clean and convenient with the Grundig GSN10710DW Tall Fridge. ___________________________________________________________________________ PLEASE NOTE: Use in outbuildings: This refrigerator is not designed to be used in an outbuilding - both your food and the appliance can be damaged. Do not use it in any unheated area. Reversible door hinges: This refrigerator has a reversible door - please consult manufacturer to carry out door reversal. We are comparing prices for Grundig GSN10710DW Tall Fridge in new condition sold by Currys Pc World.